In 2014, I read The Education of a Coach, a book about Bill Belichick which influenced me immensely (coincidentally, the Patriots have also read my book and were influenced by it). Anyway, I have been chasing that high ever since. Bill Walsh’s book certainly met that high standard. Out of all the books I read this year, I marked this one up the most. Even if you’ve never watched a down of football, you’ll get something out of this book. Walsh took the 49ers from the worst team in football to the Super Bowl in less than 3 years. How? Not with a grand vision or pure ambition, but with what he called the Standard of Performance. That is: How to practice. How to dress. How to hold the ball. Where to be on a play down the very inch. Which skills mattered for each position. How much effort to give. By upholding these standards—whatever they happen to be for your chosen craft—success will take care of itself. There is never a better time to do the hard things when things are going extremely well and that can be as an individual that can be as a team as well. “Number nine, never fall prey to the belief that getting to the top makes everything easy.” It doesn’t, it makes it harder. “Number 10, recognize that mastery is a process, not a destination.” That’s what Bill Walsh had to say. The book is The Score Takes Care of Itself, a fantastic, fantastic tome of lists and everything that he’s learned in managing some very, very hard and ego-driven people, football players through the most losing team in the world to winning four Super Bowls in a row, amazing turnaround that he did by building a team and focusing on those details. 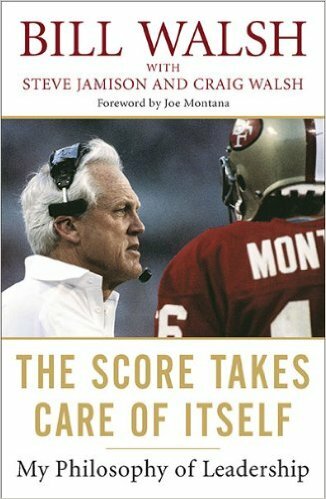 The Score Will Take Care of Itself by Bill Walsh: Amazing primer on leading a team and the first book I recommend for recently promoted managers. Bill Walsh is a towering figure in the history of the NFL. His advanced leadership transformed the San Francisco 49ers from the worst franchise in sports to a legendary dynasty. In the process, he changed the way football is played. Prior to his death, Walsh granted a series of exclusive interviews to bestselling author Steve Jamison. These became his ultimate lecture on leadership. Additional insights and perspective are provided by Hall of Fame quarterback Joe Montana and others.